Last minute doesn't mean less amazing! Here is a list of costumes that you can put together in minutes. Most of them can be created with items you already have in your home! If you're already a crazy cat lady in real life, you will probably have a bunch of cat plushies in your home. 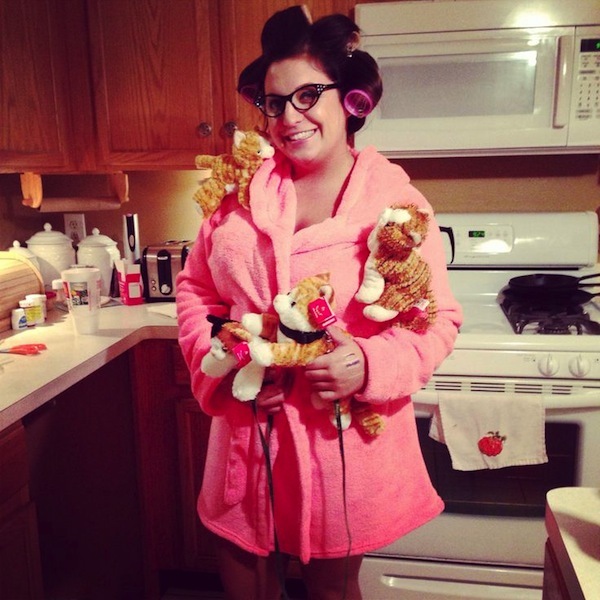 Stick them on you, wear a bathrobe, and do up your hair in curlers to instantly show off your crazy cat lady status. Are you totally over costumes this year? Buck the trend by writing the words "Error 404: Costume Not Found" on a plain white shirt. Take a cue from Jim from The Office for what might be the easiest costume on the planet. Go as the one percent by wearing fancy clothes and holding up an iPad that says one percent, or some monopoly money as shown here. 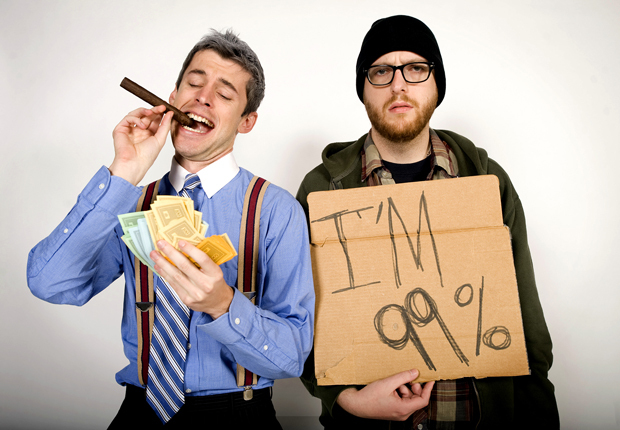 Go as the 99 percent by making a cardboard sign and dressing in casual, more free-spirited clothes. Party like a wild animal in your animal-print outfits, or animal ears with party hats! Wear PJs, pigtails, minimal makeup, and slippers, and carry a stuffed toy. Go as static cling this Halloween. All you need to do is pin socks and dryer sheets on your clothes. Don't forget to muss up your hair! Get a bunch of purple or green balloons, blow them up, then stick them on your clothes. You can just throw on a green accessory for the leaves, or draw and cut out leaves from regular paper. You definitely won't scare anyone with this costume. Wear a plaid top, jeans, and a sun hat, and paint your face to complete the look. Make unicorn horns by rolling up a piece of paper to make a cone. Wear pastels or white, and you have your unicorn costume! Probably the easiest costume ever — throw on a pair of shades and wear a white, collared button-down shirt. 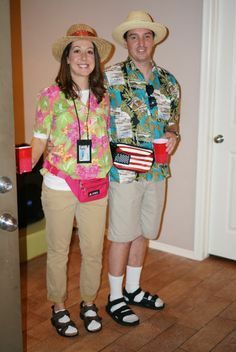 Sandals with socks, Hawaiian shirts, oh my. 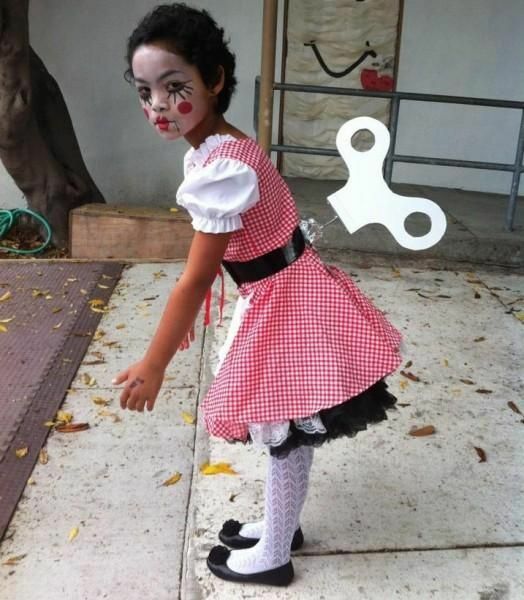 Dress up in a doll-like or ballerina outfit, and stick a DIY windup key on your back. You can make it from duct tape and cardboard! This play-on-words costume is so punny and easy to make.